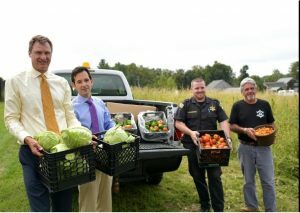 Sheriff Lew Evangelids, Special Sheriff Andrew Abdella, Corrections Officer Bryan Alstrom and Farm Manager Lt. David Kalagher show off vegetables harvested at the jail’s farm in West Boylston, MA. WEST BOYLSTON – A white-bearded inmate emerged from a row of green beans at the Worcester County Jail and House of Correction farm, and smiled at a compliment on all the vegetables picked that day: tomatoes, squash, green peppers and cabbages by the bushel. “You know who you have to thank for all (these vegetables) is the good Lord,” said the inmate, who gave his name as Rich. He said he’d been putting seeds in the ground since he was five. Food pantries across Worcester County receive hundreds of pounds of fresh produce daily from the farm during the growing season, said Worcester County Sheriff Lewis G. Evangelidis, leading a tour of the farm one morning this past week. So is the process of growing it, in a way. Tony described starting out in the spring planting the seeds. “Poke a hole in the ground, take one step, poke another hole in the ground, put a seed right in the hole, cover it up, and then you water it,” he said. “At the end of every day, I’d feel an accomplishment – I seeded eight rows today, I seeded 10 rows today,” he said. When the plants grew, and then the tomatoes and zucchinis began appearing on the supper table, he said, it was rewarding. Lt. David Kalagher manages the farm, which employs a dozen inmates, and produces thousands of pounds of vegetables – zucchini, green beans, tomatoes, green peppers, summer and spaghetti squash, and cabbage – that are used in the jail and delivered to food banks. Sheriff Evangelidis noted that for a few hundred dollars, the farm probably produces tens of thousands of dollars worth of organic food. Lt. Kalagher said the farm is 100 percent organic, using no chemicals of any kind. Zucchini and summer squash have done particularly well this year, he said. Southern watermelons, the kind that are yellow on the inside, are being tried out this year, and if they work out, will be planted next year. Cabbage this season is in a fourth planting. This year’s bush-bean yield has been enormous. He said a field dedicated to butternut and acorn squash has benefited from a new 6-foot metal fence: Hungry deer try to break into jail, and the fence keeps them out. Another field is dedicated to growing feed corn. Plans call for adding sweet corn next year. A new greenhouse, built for under $500 using all recycled materials, will be kept at 75 degrees during the winter and used to grow flowers. Pumpkins and bundles of corn stalks from the farm will be delivered to every senior center in the county for fall decorations, Lt. Kalagher said. The Worcester County Jail and House of Correction sits on more than 300 acres in West Boylston. “This has been a farm for a hundred-and-something years,” said Lt. Kalagher, who recalls when there were 60 head of cattle here. “Every jail had a farm at one time,” he said. Worcester’s, which had lapsed, was restored when Sheriff Evangelidis arrived seven years ago, he said.